Mercury went retrograde this past Monday. If you thought the last couple weeks of college football were a carnival ride, buckle in. What says the almanac? Mercury’s retrograde periods can cause our plans to go awry. However, this is an excellent time to reflect on the past. Intuition is high during these periods, and coincidences can be extraordinary. When Mercury is retrograde, remain flexible, allow time for extra travel, and avoid signing contracts. Review projects and plans at these times, but wait until Mercury is direct again to make any final decisions. […] In astrology, Mercury influences travel, literature, poetry, merchants, and thieves. He is cunning and witty at a moment’s notice. But he is also recognized as a trickster and prone to misbehavior. • No. 10 Texas Tech at no. 15 Oklahoma.2 Kliff Kingsbury hasn’t been on the job long enough to homogenize every word that comes out of his mouth into coachspeaking platitudes, but he’s already a fierce defender of that evergreen sentiment — sing along if you know the words — We’re Taking It One Game At A Time. “There is no championship on the line,” Kingsbury said earlier this week, which is a valid mind-set for a guy coming off a 10-point road win over West Virginia and heading to visit Oklahoma. And while he’s not wrong — Tech could lose to Oklahoma and still clinch a Big 12 championship with a well-timed Sooners face plant — there are three teams in the league with spotless conference records to this point: Texas Tech, Baylor, and Texas. Only two of those programs boast undefeated overall records, and both the Red Raiders and the Bears are staring down a season-ending gauntlet that includes scheduled clashes with the Sooners, Cowboys, Longhorns, and each other. Let’s take this moment to dispense your regular reminder that Tech has cranked out this undefeated half-season under a first-time head coach and is currently on its third starting quarterback since summer camp. When it became evident that first-stringer Michael Brewer’s back injury would hold him out of the Red Raiders’ season opener at SMU, true freshman walk-on Baker Mayfield was tapped, and recorded 1,488 passing yards in four games and three quarters of a fifth before being sidelined during the Kansas game with a knee injury. True freshman Davis Webb tagged in and has thrown for 1,427 yards since. As of Wednesday night, Kingsbury hadn’t named a starting QB for the Oklahoma trip, but after witnessing the two-headed fireworks show of Weeks 1 through 8, it’s hard to pick a favorite. • No. 12 UCLA at no. 3 Oregon. It feels unnatural to even type “no. 3 Oregon,” but the Ducks, edged out in the year’s first set of BCS rankings, have been doubted before. After their Week 1 pasting of Nicholls State, you might have wondered whether the Ducks could maintain their torrid scoring pace against out-of-conference AQ competition like Virginia and Tennessee. When they just about did, you might have wondered how they’d fare against the lesser luminaries of the Pac-12, or against brighter division foes. Oregon has outscored its conference competition 219-94 through Week 8. 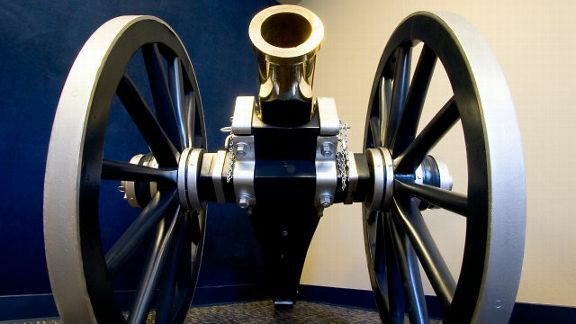 With all those teams readily dispatched, the Ducks dive into the deep end, beginning with this week’s home stand versus the Bruins, continuing in Thursday prime time at Stanford in Week 11, and concluding with a Civil War game that looks a sight more interesting now than it did in September. • No. 21 South Carolina at no. 5 Missouri. Gamecocks-Tigers has the dreary distinction of being one of two SEC games that will kick off with both starting quarterbacks already injured. As of this writing, we’re expecting to see Johnny Manziel and have no definitive word on Austyn Carta-Samuels’s status for Texas A&M–Vandy, but we know Carolina-Mizzou will start two backups, with Dylan Thompson playing in place of Connor Shaw for at least this week and Maty Mauk spelling James Franklin for a minimum of several weeks to come. • No. 6 Stanford at no. 25 Oregon State. We wrote off the Beavers after Week 1. That’s a thing you can do when the no. 25 team in the preseason AP poll loses, at home, to Eastern Washington. Even against a good FCS team4 there’s no such thing as A Good FCS Loss, and the Beavers were summarily banished from the radar — until they blasted their way back into the conversation with the nation’s most prolific passing offense.5 Quarterback Sean Mannion, who didn’t even earn the 2013 starting job until the week before that Eastern Washington game, and receiver Brandin Cooks have 12 touchdown hookups through seven games, which, when added to their six previous scores, makes them program career record-holders. Oregon State is 4-0 in conference play, including an overtime shootout win against the Utah team that handed Stanford its only loss, and has supplanted skidding Washington as the third power in the Pac-12 North. Weeknight Football: Should I Bother? Not until Friday and Boise State–BYU (8 p.m., ESPN), unless you’re particularly interested in CUSAction or an SEC dregs fight. 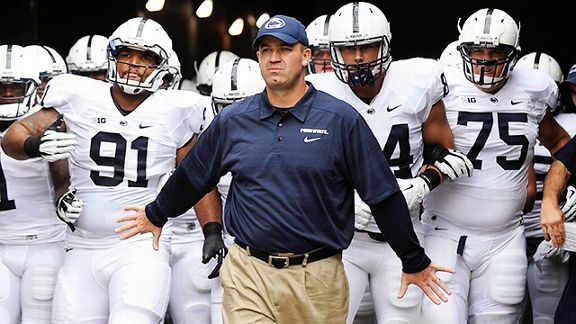 In 2012, Penn State went 8-4 under first-year head coach Bill O’Brien, defeating the likes of Northwestern and Wisconsin along the way. The Nittany Lions’ biggest loss came at home, 35-23 versus an eventually undefeated Ohio State team. One year later, the fourth-ranked Buckeyes still haven’t lost, and Penn State is headed to Columbus with a 4-2 record (8 p.m., ABC). We spoke with Coach O’Brien on Wednesday, which also happened to be his 44th birthday, about readjusting to life in college ball, the unexpected hurdles that confront first-time head coaches, and his impressive new quarterback, true freshman Christian Hackenberg. First of all, how’s your birthday going? You know, I’m not a real big birthday guy. I love other people’s birthdays, like my kids’ and my wife’s, but not my own. I’d say the best birthday present I got was my wife got me a golf club, a PING driver. It’s not gonna help my game, but it looks nice in my golf bag. Talking to a bunch of first-time head coaches this past summer, almost all of them spoke of being unprepared to some degree to handle the administrative side of things in their new position. Where were your biggest difficulties in your first year? Certainly, in your first year as a head coach, you’re really never prepared for all the things that come across your desk, ranging from scheduling to player issues, things like that that you have to deal with on a moment’s notice, in some cases. But I think one year going through that helps you to deal with it in your second and third years, and your fourth year — if you last that long. I would say that the 2013 season has been more about football than the 2012 season, overall, just based on the sanctions that came out in July of 2012, and then having to deal with the transfers, it just seemed like something was coming up every week. But this year’s been a lot more about football, which, that’s what we all love. What was the biggest change you found in college coaching after being away in the pros? Recruiting! Recruiting. Even in the five years that I wasn’t in college [football], there are so many more websites, Twitter, Facebook, and all the things that weren’t really being used back in the early 2000s when I was a college assistant. What about in the players themselves? I do think that quarterbacks are more prepared, with all the camps, the Elite 11. If you look at Christian Hackenberg, he worked with Trent Dilfer. Trent Dilfer was a Super Bowl–winning quarterback. You’re going to gain a lot from working with a guy like that. The only thing I worry about, with all those things, is that if a guy goes to too many of those camps, he’s hearing way too many opinions on his own skill set. I think you have to, as a high school player, just be careful about how many [people] you put yourself out there with, if that makes any sense. But I do think they’re more prepared, and I give the high school coaches a lot of credit. There are some really good offensive systems out there. So you’ve had a shutout, a bad loss, and a quadruple-overtime win in the past few games. Has it been tricky to keep the kids on the team even-keeled after those results? This is a very focused bunch of kids. Whether it’s a big win or a bad loss, we move on to the next week. We’ll review the game that we just played, but we quickly put that one in the books and move on. I give our kids a lot of credit; they tend to focus on the path ahead. And I give our staff a lot of credit. We have been a little inconsistent. I think that’s a combination of things. I think, number one, we have to do a better job of coaching. I think it starts with myself as the head coach, just doing a better job of getting the team prepared, and then I think, you know, we have a young team. We’re young in certain spots. Speaking of youth: Hackenberg is putting up numbers at quarterback that aren’t your typical true-freshman numbers. He’s a guy that came in here with a really sharp mind. He’s got a calmness about him; he’s a quietly confident kid. And he’s able to learn. He’s very competitive. And I think we run a good system here, a system that — I call it customer-friendly. It’s quarterback-friendly. There’s progressions to it, and he’s been able to do them. You come here, and you put the time in, you can learn it. I’ve been there to work a guy out when I was in the NFL, but not to a game. You’ve had 40-plus points scored on you two games in a row now. How are you preparing for the Buckeyes’ scoring threats? Well, you have to look at what their strengths are, especially as it relates to their players. So obviously Braxton Miller, it all starts with him. And you have to do a fantastic job of making sure that you understand the plays that they run with him. He touches the ball on every single play, and he’s a dynamic player. And you look at Carlos Hyde, he’s a guy you’ve gotta wrap up, you’d better tackle, because if you don’t, he’s gonna run for a lot of yards. And then obviously they have some really good receivers, but I think it starts with Braxton and you go from there. I also think that in today’s college football, you look at defenses out there, and our defensive stats, we’ve played pretty well this year. It’s very difficult to stop these college offenses. You know, getting 400 yards of offense in a game nowadays is, like, no big deal. • Which winless team is likeliest to climb out of the oh-fer well in Week 9? We like 0-8 Western Michigan at 1-6 UMass, because (a) UMass, and (b) WMU getting a win means P.J. Fleck giving a victory speech that’ll go down in history. With the release of the first set of BCS standings, we’ll be referring to teams by their BCS rankings instead of AP in order to keep the numbers here consistent with those on the teams’ ESPN pages. Bama remains no. 1 either way; never fear. This season, in this division, being down “only” your starting quarterback and a senior corner halfway through the season counts as lucky. The Eagles are now 5-2 and tied with Montana State for first place in the Big Sky standings. But REALLY. Trivia from OSU sports info: The Beavers still lurk outside the Top 25 in the AP and coaches’ polls, but if they get back in they’ll be the first team to do so since Virginia Tech’s rebound from James Madison in 2010.